A week from now, Saturday 17th, Palmeiras welcome Shandong Luneng Taishan F.C. from China to the Allianz Parque for a friendly game. The event marks Oswaldo de Oliveira’s debut as coach for Palmeiras, and also his first opportunity to test the newly assembled 2015 squad. Shandong Luneng were founded in 1993 and are based in the capital of Jinan, coastal province of Shandong, eastern China. In the Chinese Super League, where 16 teams battle it out, Shandong finished fourth last season. In spite of its young age, the club has already won the League four times, in addition to winning six different Cup titles. 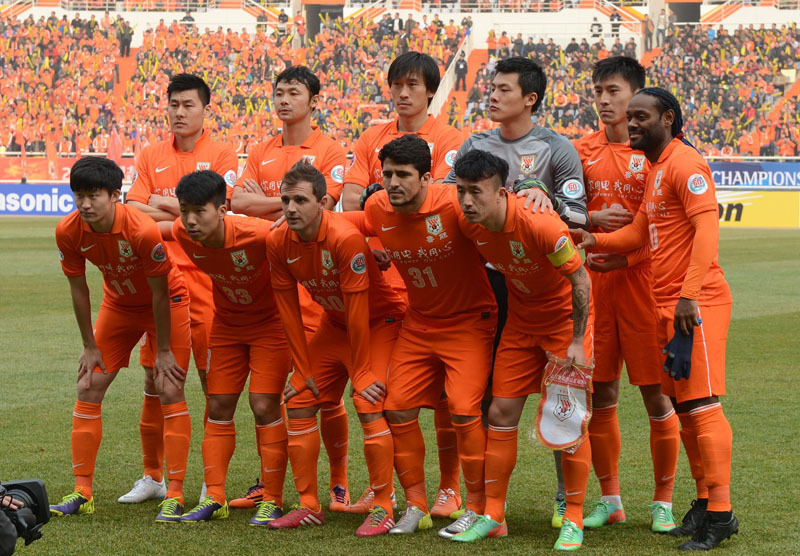 Shandong are currently sponsored by Nike. The “Orange Fighters”, as Shandong are nicknamed, have a Brazilian coach in former Atlético Mineiro coach Cuca. He runs the show with his technical staff of nine, all of them Brazilian except for three. You will also find Brazilian players in Shandong’s squad, most notably former Palmeiras forward Vágner Love (furthest to the right) Midfielder Júnior Urso and former SPFC forward Aloísio complete the trio. It’s likely that yet another Brazilian will join the squad soon: national squad striker Diego Tardelli, who worked with Cuca at Atlético. A conclusion is expected within days. In 2013, Shandong signed a “sister club” relationship with São Paulo FC. Shandong have similar relationships with Australian Adelaide United and Japanese Jubilo Iwata. Before Palmeiras’ debut in the São Paulo Cup on 1 February, one more friendly is expected, on 24 January, opponent to be confirmed.